We have everything you need to start dispensing prefabricated foot orthotics to your patients IMMEDIATELY. We offer the products, education, and support you need to feel confident treating everyone from ages 1 to 101! WHY TREAT ALL FEET THE SAME? 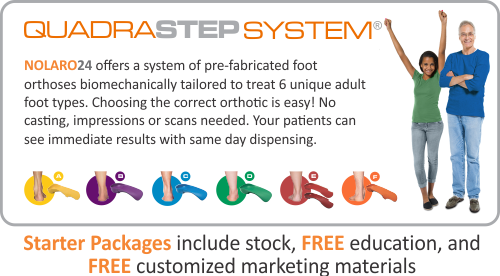 REVOLUTIONIZE Your Orthotic Practice TODAY! Don't miss a lecture by Louis J. DeCaro, DPM! Check out what's happening for the second quarter at Nolaro24 on our blog version of our newsletter! EMAIL US to be put on our newsletter list!